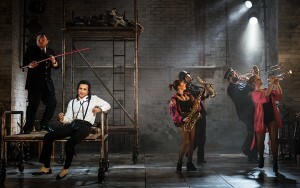 Richard Pilgrim reviews a new production of a great classic of German pre-war theatre, Bertolt Brecht's ‘The Threepenny Opera’. Bertolt Brecht held the belief that theatre should educate, not just entertain. 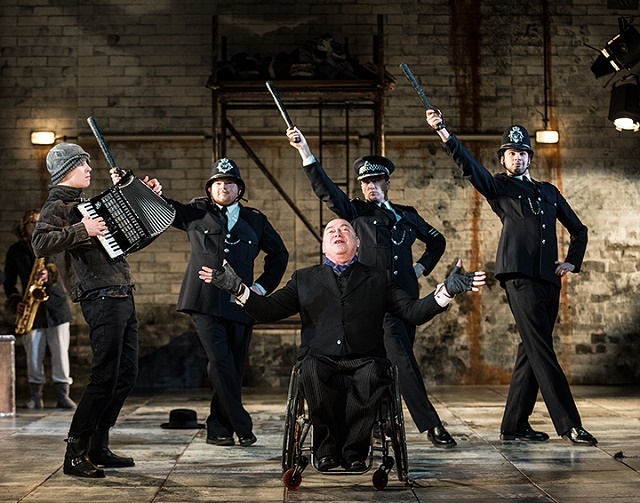 One of his best-known works (certainly in this country) is ‘The Threepenny Opera’ and as a piece of theatre, this current production hits the mark exactly as Brecht would have wanted. Now playing at the Nottingham Playhouse (other UK tour dates are available – see below) we see a production that is, in this respect, faithful to Brecht’s aims and which does a very credible job of revealing to what was essentially a modern middle-class audience, the spirit of what this ‘left-wing’ anti-establishment musical drama is all about. 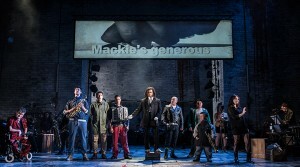 The list of credits for this production is almost as long as those for a Hollywood film: The Threepenny Opera is presented to us by the Birmingham Repertory Theatre, the Graeae Theatre Company, the New Wolsey Theatre Ipswich, the Nottingham Playhouse Theatre Company and the West Yorkshire Playhouse. Needless to say, there is one hell of a theatrical collaboration going on here – but then, in many respects, this is one hell of a theatrical production. Things do not get any less complicated when one considers how this production has managed to navigate itself through history before landing onto a 21st century stage. Almost three hundred years ago, in 1728, Englishman John Gay wrote what was then known as a ‘ballad-opera,’ which he named ‘The Beggar’s Opera’. Originally, the songs Gay included in the score were simple, well-known local ballads that were intended to be sung without musical accompaniment. However, a musical score was added to the original production and Gay’s piece of theatre turned out to be the sensation of its time. Exactly two hundred years later, in 1928, dramatist Bertolt Brecht and musician Kurt Weill, working with translator Elisabeth Hauptmann, took Gay’s work and transformed it into what became one of the greatest classics of German pre-war theatre, ‘The Threepenny Opera’. Whilst many adaptations of this work have emerged in the years since, it was Robert David MacDonald and Jeremy Sams who translated Brecht’s and Weill’s work back into English, and eventually brought this remarkable performance to the Nottingham stage this week. Confused? Don’t be – this is an English translation of a German translation of an English script, with an adaptation of the German adaptation of the musical score and lyrics, translated back into English. Simple. Inevitably, there are moments in the production when it almost seems to be suffering from some of that confusion (moments when it could be said that something has been ‘lost in translation’, perhaps?) Certainly in the first half (which is basically Act One of the opera) the narrative seems to drift off slightly, becoming somewhat disjointed and incoherent – although how much of this is due to production difficulties and how much is due to Gay/Brecht’s original scripts, is hard to tell. What isn’t hard to ignore, however, is the sheer effort and commitment the cast displays in bringing this entertainment before us. Boy, did this crew of almost twenty talented artists work hard! 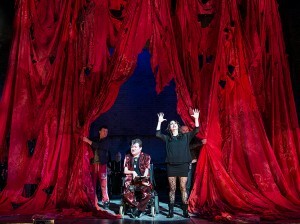 Many members of the cast had some kind of disability –the Graeae Theatre Company helps to challenge performance preconceptions by placing deaf and disabled artists in the centre stage – and how lucky we are not to have the gifts of these great performers overlooked. There has always been talk of the ‘troupe’ as a feature of theatrical life, but this team surpassed that spirit of camaraderie by exhibiting a greater sense of mutual trust than I have ever seen in a theatrical company before. It was great teamwork – and every member of the cast looked as if they were enjoying themselves too. Gay’s ‘Beggar’s Opera’ was considered at the time to be almost an ‘anti-opera’, because the intention was for it to be a satirical swipe at the increasing rise in popularity of Italian opera in London. However, the story also satirized politics, poverty and injustice, focusing on a target of corruption at all levels of society. This was a popular theme in eighteenth-century theatre (indeed, in the arts in general at the time) and this production brought this theme bang up to date with its cheeky poke at the establishment’s hypocrisy in respect of the Jimmy Savile affair, of our politicians’ duplicity (aimed largely at David Cameron, hurrah! ), and of the iniquities of our ruling classes – in particular, the Royal Family. This is exactly how it would have been done in Gay’s day, and modern directors Peter Rowe and Jenny Sealey didn’t miss a trick in that respect – showing that they understood the original play better than, I suspect, most of the audience. Brecht believed that theatre should be a place where an audience could critically approach problems, look for solutions, and act upon their decisions. He believed that audience members should have a sense of social responsibility and also a sense of fun. We are certainly given an opportunity to do that by this production. Part of the sense of fun is to be found in the almost perfect rendition of Weill’s melodies, belted out by a confident and talented cast of singers. Prominent amongst them are Amelia Cavallo as Jenny (whose dominance of the stage, and marvellous voice, was mesmerizing), CiCi Howells as Polly Peachum and Garry Robson as JJ Peachum. For her part, Victoria Oruwari sings like the classically trained soprano that she is, moving around the stage with astounding confidence. While there were some technical problems, I saw a preview performance, so this was to be expected. (The somewhat awkward transition between acts Two and Three, where the audience was presented with a hiatus and asked to ‘talk amongst yourselves’ clearly was intentional). However, none of this detracted from the enormous fun that the cast, and the audience, was obviously enjoying. Based on your review I went to see it last night at The Birmingham Rep and I was not disappointed, Enjoyed it very much and loved its swipe at the corruption and hypocrisy of the ruling establishment in present-day British society. Thank you!